The Adirondack Hockey Hall of Fame will open in 2010 to establish a "memorial to those who have developed the sport in the Adirondack region." The hall will hold its first ever inductions Saturday, March 13, 2010. 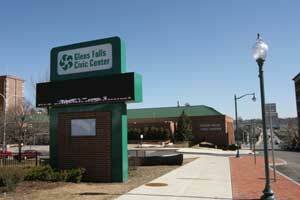 The Hall of Fame will be located in Glens Falls NY in the lobby of the Glens Falls Civic Center. The hall will honor players, coaches, officials, executives, media and boosters who have made noteworthy contributions to the sport in the area within the last 30 years. It is designed to celebrate the history of the sport in this region, featuring areas from Saratoga County, Warren County, Saratoga Springs up to Schroon Lake. The hall will not only recognize professional hockey, such as the Adirondack Phantoms and the Red Wings, but also intends to recognize top high school hockey players, college hockey and women's hockey, as well. Anyone who was involved with hockey in the area is eligible for a nomination. The Hall of Fame weekend is scheduled for March 12-14, 2010 at a time when the Phantoms have 3 straight home games. Click here for a full schedule or to purchase Phantoms tickets. Inductions will be made during a luncheon at noon on Sat. March 13. And introductions will be made before the start of the Phantoms game on Saturday, March 13. The public may submit other nominations to the Hall of Fame by emailing Mike Thompson, Vice President of the Adirondack Phantoms, at: [email protected] Selections will then be made by a committee consisting of eight members.